Passionately Rivalicious is a mother-daughter team that decided to turn their passion for college athletics into a business. They mapped out their plan over lunch three years ago and haven't looked back. I met Randi and Linda when I spoke at the Arkansas Women Bloggers Unplugged conference last month. We instantly hit it off. We had such a great time together that we decided to team up and do a giveaway. YAY! 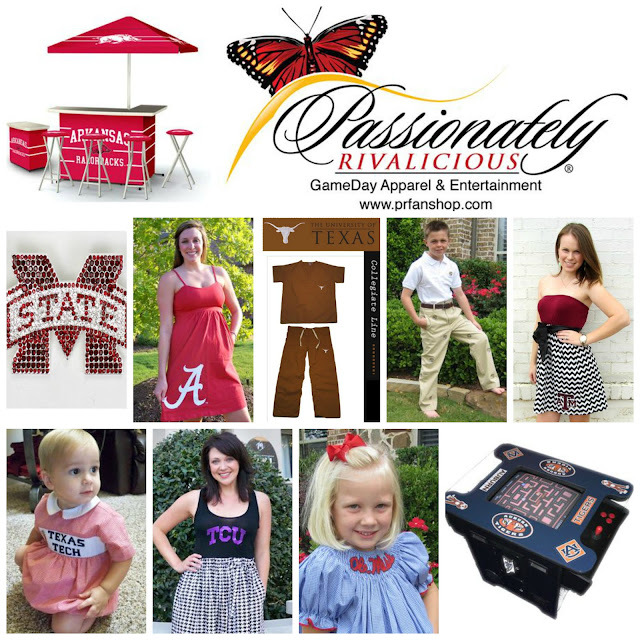 Passionately Rivalicious represents 26 NCAA Universities, from the Big 12, SEC, SMU and Clemson. They have tons of amazing products. If your university isn't listed, make sure to shop by color. All the clothing is SO cute! Perfect for watching the game on Saturday. I LOVE the Tailgating Bar and the Rivalicious® Arcade Game Table. The game table reminds me of eating at Pizza Hut as a kid and playing video games after dinner. I definitely had Pac-Man back in the day! Passionately Rivalicious is going to give 2 lucky Plain Chicken readers a $50 gift certificate to shop at their online store. I am giving you lots of chances to win. You can do one or all of them. Use the rafllecopter widget below to enter for a chance to win. The giveaway ends Friday, October 11, 2013 @ 11:59PM CDT. The winners will be contacted by email and have 48 hours to respond. If the winners don't respond within 48 hours, a new winner may be selected. Good Luck! Amazing products! I so want them all! I could use some of this stuff! Leaving for Auburn shortly! War Eagle! Love the Bama flip flops, bracelet, and girl's vest and headband. Oh there's some cute things!!!! Classic Fleece Logo Blanket and Flip Flops too. I would buy something for my niece who is a huge Ole Miss fan. I would buy something purple to wear when I support my Furman Paladins! So many cute things! I think I would pick the ISU game day black and crimson reversible vest! so many goodies.....love this site! I want one of everything that has a razorback on it. I want the kids items! Maroon Cascading Cardigan is what I would buy! Love it! WIsconsin Badgers items are on my wish list! Awesome items to choose from! Anything Wisconsin related is on my wish list!! Ohio State sweatshirt! I now live in Michigan and it's certainly not readily available to buy anything Ohio State! I love the cute college stuff!!! I love the lunch tote, blanket, cooler, pillow, Ahhh! So many cute things! I love the plush pillows! And all the clothes! I would definitely buy some Tennessee gear! They don't have my team, so I would buy some Ole Miss gear for my parents! Decisions, decisions...my heart is UT, and we're big Aggie fans, but since the hubster is sitting and watching his alma mater, Baylor, as I type, I'm going to have to choose the Plush Mulberry Yellow 20"x20" Pillow!!! Go BEARS!!! Weagle Weagle! It looks cute! I would love to have something with smocking for my great granddaughter. I would love to win something Arkansas for my husband! I like the scrubs and flip flops! Some Kentucky goodies for my mother would be awesome! An OU scarf or shirt! I would buy something LSU related! This is such a cute idea for a mother-daughter business! What a fun business! I would buy the University of Kansas UltraSoft Blanket for my husband to keep in the man cave. I'd get some LSU gear! I would have to get the OU flashdance sweatshirt! i'd get either the UF flip flops or the UF/GA house divided mat! Anything Auburn, but I love the Savannah orange/blue toddler dress! Would love anything Alabama. Will be visiting their site now!! Love this business! Love UVA! I would love the University of Alabama Swarovski Crystal Jersey Tee and the University of Alabama Camo Cap.. both would be a nice touch. I love anything with a Razorback!